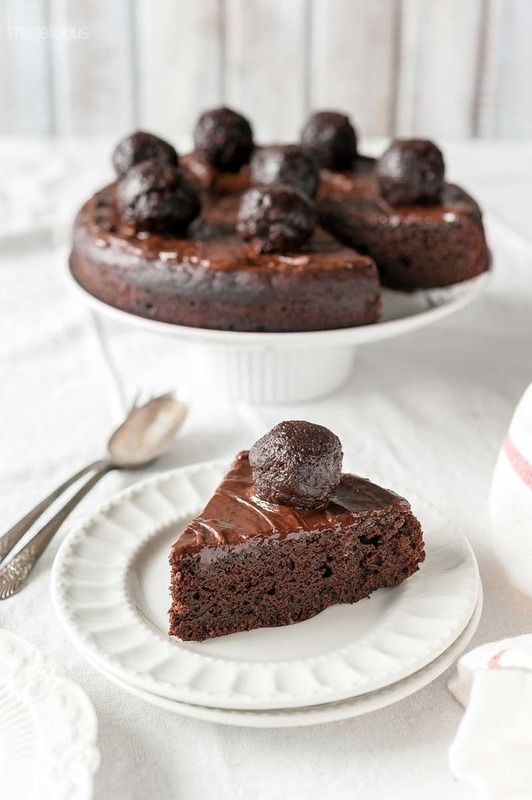 This Chocolate Kefir Cake is moist and delicious. 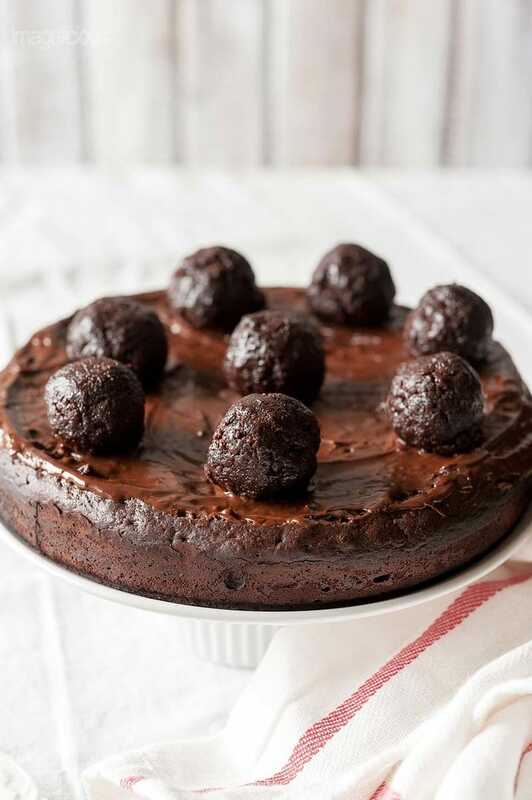 It’s lighter than regular chocolate cake but still has intense flavour and is perfect to end any meal. Great for Valentine’s Day dessert. If I had to choose between cooking and baking I’d choose baking. Since I was little I always had a soft spot for magic (yes, I am obsessed with Harry Potter) and baking is a way to bring magic into our everyday mundane lives. Flour, water, yeast – first it’s just a clump, then minutes later it transforms into silky dough and in a few hours it magically rises and gets all soft and pillowy. 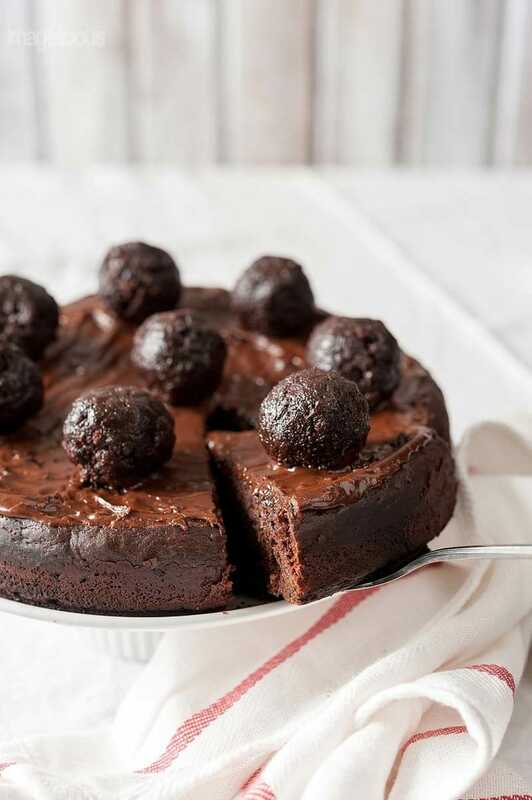 Chocolate, sugar, butter, eggs melted and mixed together make the most luscious chocolate cake without even a tablespoon of flour – isn’t that magical? Flour, sugar, eggs, butter – mix these four and you get so may delicious goodies – pancakes, waffles, biscuits, scones, cakes, muffins, cupcakes! I love baking! I love science and magic behind folding and creaming and mixing and rolling all the ingredients. If I had lots of time and three times as many bowls and whisks and spatulas as I currently have and if I wasn’t worried about all the sugar and oil and butter and cream and million of delicious calories, I’d be baking elaborate layer cakes with whipped buttercream concoctions. But unfortunately my waist can’t afford all the eclairs and donuts and cupcakes my heart desires and the baby wants me to play with her instead of making napoleon, frostings and pralines. So, I stick with lighter and easier cakes. Cakes that are still delicious but take almost no time to make. Cakes that satisfy the sweet tooth and late night cravings but don’t leave you feeling too guilty. 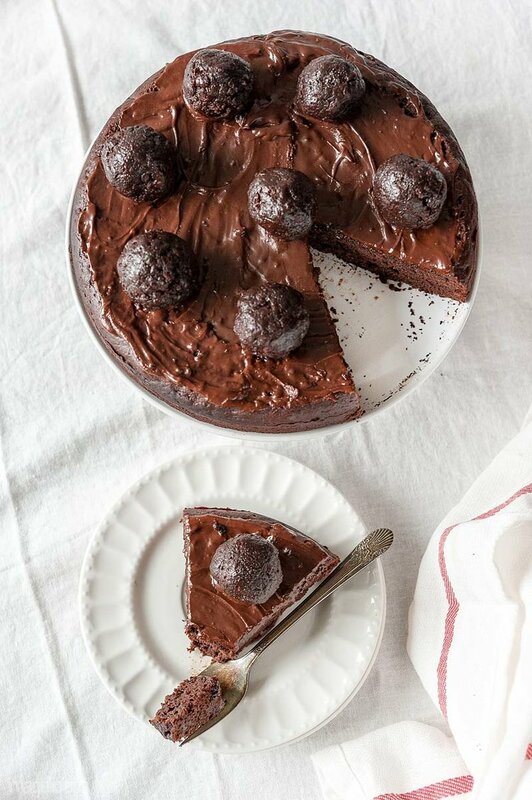 This Chocolate Kefir Cake is perfect for a casual weeknight dessert or for an intimate and cozy get-together. It’s lighter on calories and sugar so you can have a slice or two after a nice dinner. Perfect way to end a family celebration or a romantic Valentine’s Day meal. 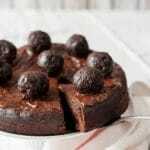 I made this Chocolate Kefir Cake a few times with a few variations. I like my dessert less sweet and I often reduce sugar in recipes. This cake has 3/4 cup of sugar which I find works perfect with the glaze. However, when I made this cake to bring to a dinner party I attended a few weeks ago, I soaked the cake in simple syrup made with 1/4 cup of sugar as most people prefer sweeter desserts. Kefir is a Russian version of buttermilk and can be found in almost any grocery store, however, if you can’t find Kefir you can use Buttermilk instead. Butter an 8-inch cake springform pan and dust it with cocoa powder. In a large bowl whisk together flour, sugar, cocoa powder, salt and baking powder. Add oil, apple sauce, kefir, orange juice and orange oil. Mix together until smooth batter forms and all flour disappears. Pour the batter into the prepared pan and bake for 50-55 minutes or until a toothpick inserted in the centre of the cake comes out clean. Melt the chocolate over a water bath or in a microwave in a small bowl. In a separate bowl mix together icing sugar, water and orange oil until smooth. Add the melted chocolate to the icing sugar bowl and mix well. Pour the glaze over the cake and enjoy. Slice the top off the cake since it'll be domed anyway. Finely crumble the sliced top of the cake and add 1 or 2 spoonfuls of the glaze to the crumbled cake. Add 1 spoon of rum (or to taste). Form balls and decorate the cake as in the pictures. If you prefer sweeter cakes, then use 1 cup of sugar instead of 3/4 cup. OR make simple syrup with dissolving 1/4 cup of sugar in 1/4 cup of water, then soaking the cake in the syrup, this makes the cake super moist. Julia, my cake ended up going flat – first it rose, then it fell…what did I do wrong? and I backed it in 9′ pan because I did not have the 8′. What a great looking cake! I definitely want to try this at home. The probiotics in the kefir get cooked away when you bake the cake correct?